The following decorating tips provide family-friendly Halloween decorations that aren’t too scary, but are great for this season – perfect for how I like to spook up the place. If you have kids that love fairy gardens, they will really enjoy this decoration! It can even be a craft the family creates together. Instead of putting the fairy garden in a large bowl or pot, you will instead use a pumpkin. Since real pumpkins go bad, it is best to find a large plastic pumpkin that you would be able to work with. What you want to do is have the garden inside the pumpkin, but be able to see it. For this, you would cut out a section of the front of the pumpkin, and set up your fairy garden there. You can get a fairy figurine like Tinkerbell or one of her friends and decorate her in little witch clothing, then add some small pumpkins to create what looks like a little fairy pumpkin patch. I found THIS adorable miniature pumpkin cottage with a witch hat that would look great in your Halloween fairy garden! The video below shows you one way you can carve into a pumpkin to create a fairy house or garden! A fun way to decorate your yard or the front of your house for Halloween is by making yard signs. 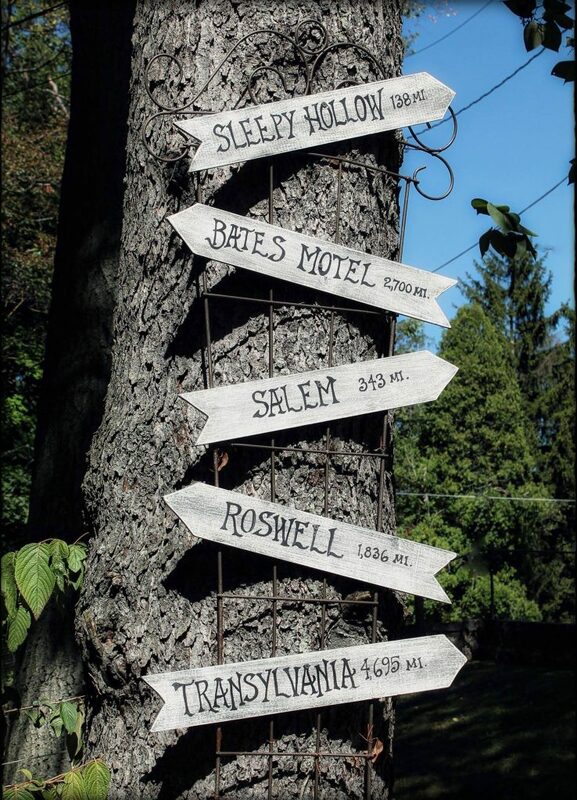 These should be the names of different Halloween or spooky places with arrow-shaped signs, as if they are showing where these spooky places are. Have things like ‘Halloween Town’, ‘Bates Motel’, ‘Transylvania’ and anywhere else you and your kids want to make signs for. Stick them on stakes in your yard or attach them to a large tree in front of your house. I particularly love the example below, which shows signs posted on an iron trellis leaning against a tree. And it’s a great detail to show how far each destination is from where you are! For porch decorations, you can make witch brooms if you are unable to find good ones online or at your local Halloween supply stores. I found these crooked Witch brooms that would be perfect if you’re not in the mood to make your own or don’t have time! But the DIY for this is really easy. You just need an old broom, since the handle and the bottom of the broom is already done. To make it look like a witch broom, get a bunch of straw and use it to cover the bottom of the broom so that it looks like the bottom of a witch’s broom. This keeps your original broom intact. You definitely need ghosts in your front yard and these ones wrap right around tree trunks for easy hanging! And if you want to DIY, there are a few different options for making ghosts you can put in your front yard. You just want a simple wire form of a body. You can then put a large white dress on the form – such as one you find at a thrift store – a white sheet, or any type of white fabric. It makes it look like ghosts are just floating on your front lawn. An easier way is to simply get plastic pumpkins – you could get several from your local dollar store! – and attach them to stakes in the yard. Cover the entire thing with an old white sheet, and your ghost is done. If you’re looking for a little more “spook for your buck,” you could try this awesome last-minute DIY ghost craft for a very cool outdoor Halloween decoration – and it only takes cheesecloth, white balloons, a black permanent marker, and glow sticks to make! 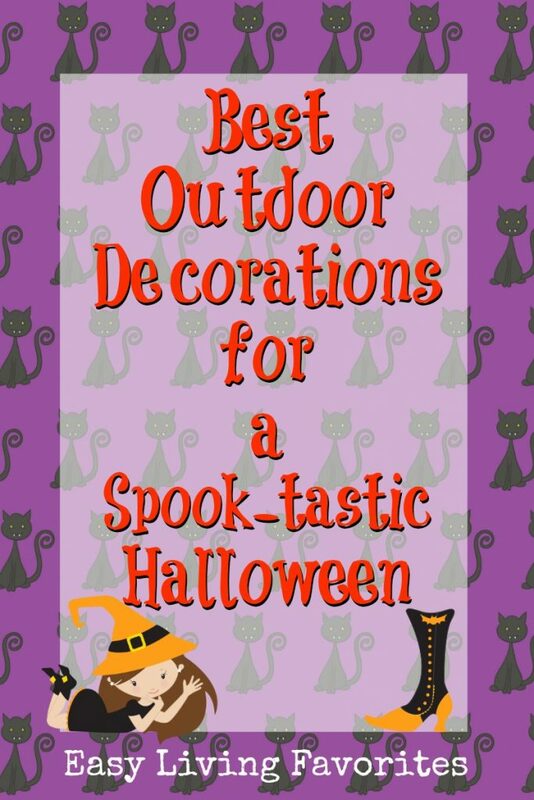 The best outdoor decorations for Halloween are the ones you love to put up year after year. Sure, you’ll have some decorations that are only good for one year, one night, like the DIY glowing ghosts. But if you plan and purchase right, you can reuse your decorations for many Halloweens to come! I love these ideas. The balloon ghosts are cool. And the signs on the trees. I’m tired of the same old decorations. Thanks for the tips! 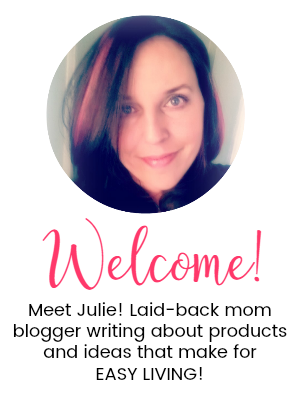 Hey Amy! Glad you liked it! I like being creative and unique, too. Thanks for stopping by!